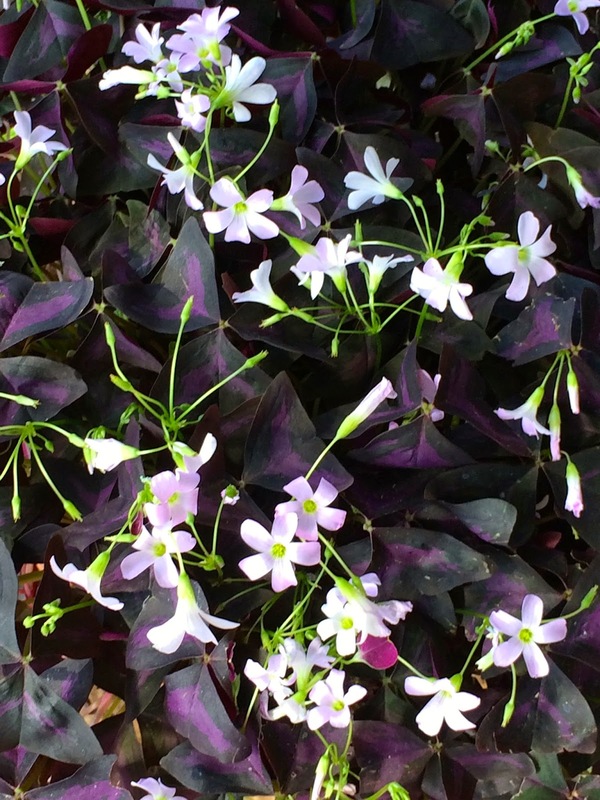 I've had plum colored clover - purple oxalis - growing in my garden for years...albeit in small patches. Nothing to write home about as it were. selected the plum and chartreuse palette for my front beds this year. now enjoys. I can attest to its cold hardiness (to 15 degrees; though I have found when mulched it can handle even colder winter conditions), relative drought tolerance and deadheading free character. I love the jaunty way the pale lilac-pink flowers bob atop delicate chartreuse stems...with a like-colored eye in the middle. RL had his growing in far more intense light and sun than I...another issue I rectified this season. Masses of pale floral ballerinas dancing on rich velvety-purple stages...great in number, again thanks to RL's generosity...he gifted me with huge clumps of these purple beauties.